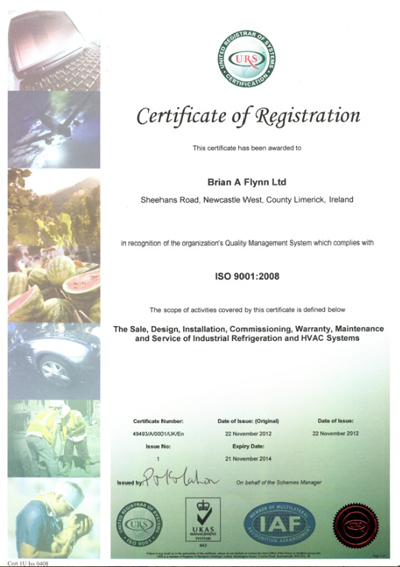 It is the aim of Brian A. Flynn Limited to provide its customers with quality industrial refrigeration systems. In order to meet customer needs and expectations the management team have adopted, and are committed to, ISO 9001:2008 as the quality management system. Allied to the need to comply with legislative requirements, the management team recognises the need to continually improve its quality system to enhance its reputation in the market place. Being customer focused, we desire to achieve our business objectives of increased growth and profitability through meeting specified requirements and the reasonable needs and expectations of our customers. We recognise that it is only through consistent and reliable quality of product that the opportunity for repeat and new business is enhanced. The B.A.F management team have established strategic and quality objectives and have implemented regular review of these through the internal audit and management review process. The management team through the QMR ensures that the Quality Management System including the quality policy is communicated to, understood and effectively implemented by all staff. It is the responsibility of all staff to adhere to the established procedures and to constructively support the B.A.F policy to strive for continual improvement.